Dr. Ann Taylor: It's swarming with wild animals down here. Dr. Stephen Marshall: If you don't bother them, they won't bother you. Dr. Ann Taylor: I'm not bothering them. After the sleeper success of his 1980 The Gods Must Be Crazy, South African filmmaker Jamie Uys returned to the Kalahari for its sequel. Filmed in 1985, the film went unreleased for almost five years. Like many sequels, this one doesn't live up to the brilliance of the original, although still remains fairly entertaining in its own right. Uys followed the style he had utilized on the first film, intertwining a trio of stories, and making use of varispeed on the film to heighten comedic effect. After gaining immense popularity with the original, The Gods Must Be Crazy II returns star N!xau to the screen as Xixo, a bushman who lives deep in the desert where his tribe has had little exposure to the outside world. When his two children become stowaways on a poacher's truck, Xixo sets out to find them, using the language of the desert only the bushmen are able to understand. The poachers, oblivious to their new cargo, make their way across the landscape, as the kids get into mischief in the back of the truck. Meanwhile, New York lawyer, Ann Taylor (Lena Farugia), and zoologist Dr. Stephen Marshall (Tom Selleck lookalike, Hans Strydom) become stranded in the desert after their plane crashes, and run into troubles of their own. Adding to the mix are a pair of soldiers from opposing factions, who take turns holding each other captive. As Xixo continues his search for his children, he will come in contact with these strange beings from the outside, and be as perplexed by them as he was on his original foray beyond the world he knows. The Gods Must Be Crazy worked on several levels, not only from a comedic stand point, but also as a social commentary. In reusing the first film's formula, several things are lost in the sequel. Where the chemistry between the original's Marius Weyers and Sandra Prinsloo worked, the same can't be said for Farugia and Strydom, who both seem to struggle with the inevitable romantic part of their relationship. The comedy comes off a little too forced, and some of it is a little too risqué for its own good, such as Farugia's repeated loss of clothing, which doesn't have the innocence Uys was able to attain in the original. The soldiers provide most of the slapstick elements, but here too there are excesses that are unnecessary, such as the film's only profanity. The special effects, including the wild animal sequences, haven't been upgraded, but don't have the same effect the second time out. The children are adorable, and some of the situations they wind up in are truly funny, but they aren't enough to carry the film. I suppose if one hasn't seen the original, the reaction to part two could be different, but if you have this is somewhat of a letdown. That said, it is still funnier than the majority of films out there. Image Transfer Review: Presented in anamorphic widescreen, the transfer here is good, but not great, due mainly to the source elements which are in need of some major cleanup. Colors are generally bright and well saturated, and black levels are respectable, but there are a good deal of minor print defects present throughout, along with some gate wobble and shrinkage in the film. Grain is fairly heavy, and the image is less than overly sharp. Audio Transfer Review: Audio is available only in English Dolby Surround. Overall things sound fine, with good frequency coverage and seperation. Dialogue is sometimes a bit obscured, but otherwise the soundtrack is free of any real technical deficiencies. Extras Review: The lone extra is a 6m:50s featurette in which cinematographer Buster Reynolds recounts his experience of working with Jamie Uys on The Gods Must Be Crazy films. He details Uys' methodology in making the movies, and some of Uys' motivation behind the work. Trailers for Groundhog Day, Hanky Panky and Murder by Death are also included. There is also a weblink to the Kalahari People's Fund, however this is a PC-only feature. 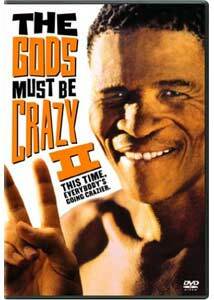 While not living up to the standards set by the original, The Gods Must Be Crazy II is entertaining in its own right, but without the magic that made the first film a classic. There are plenty of very funny sequences, but as a whole it falls flat. Recommended as a rental, or bought as part of the two-disc set for only a modest increase in the single version pricing.